Today is a national holiday, the Workers’ Day that is celebrated around the world, except in our country. We start it out with our usual breakfast on the veranda. One could get used to this. 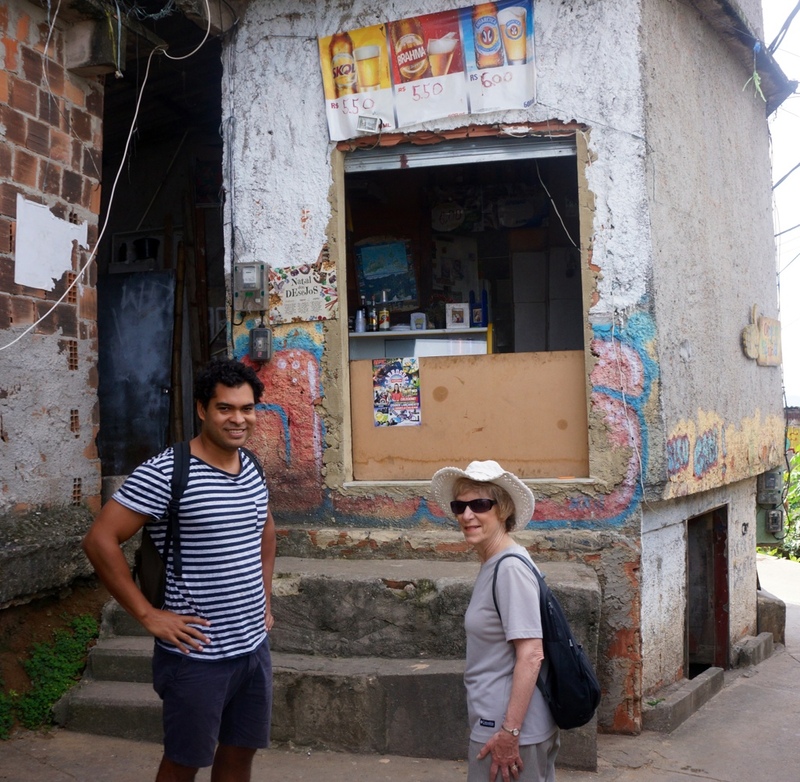 We are picked up at our hotel by, Rodrigo, a new guide from another company, who is taking us to the favela (shanty town) of Pavão-Pavãozinho, which stands on a hill overlooking Copacabana beach. 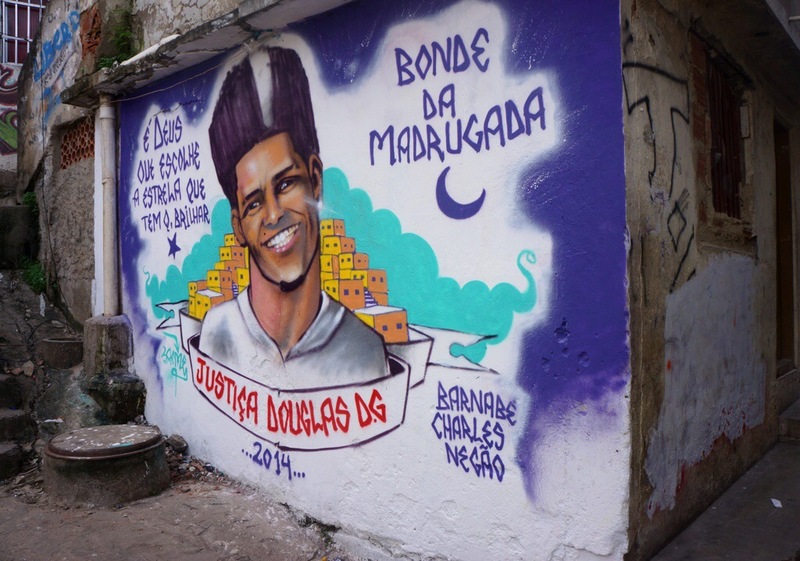 Carol asks whether it’s dangerous, and Rodrigo says, wryly, “I will get you back.” Many of you probably will have read about the riots in a Rio favela that made international news, less than a week ago. Well, that’s the favela we are going to. We walk down the very steep hill from our hotel to the train station below and take a train to a station close to the favela. On the train, we learn that Rodrigo is quite an extraordinary fellow. He’s about thirty and, for starters, speaks Portugese, English, Spanish, Dutch, German and French. As his girlfriend is Norwegian, he’s learning that, too. He runs tours that are oriented to social projects, a bent that he gets from his mother, who long ago started a project to help aged people in Rio. 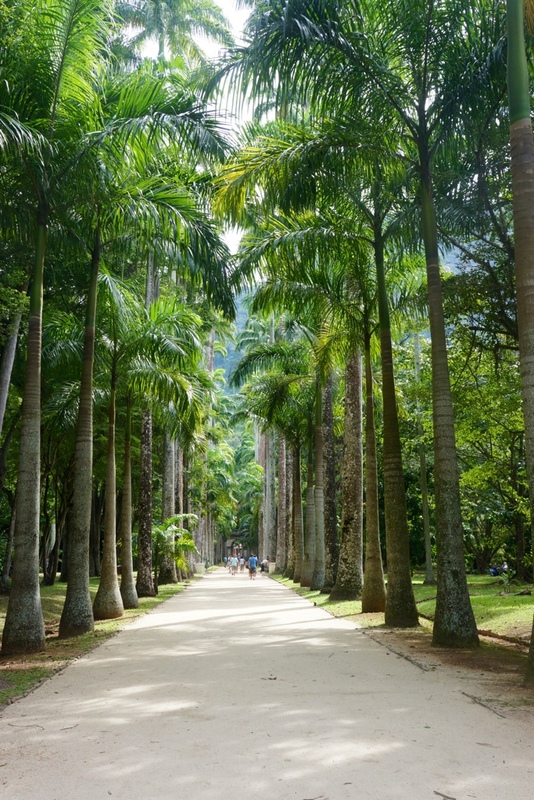 In addition, Rodrigo helps businessmen from Europe, largely Dutch, find potential investments in Brazil, in agribusiness and other types of ventures. 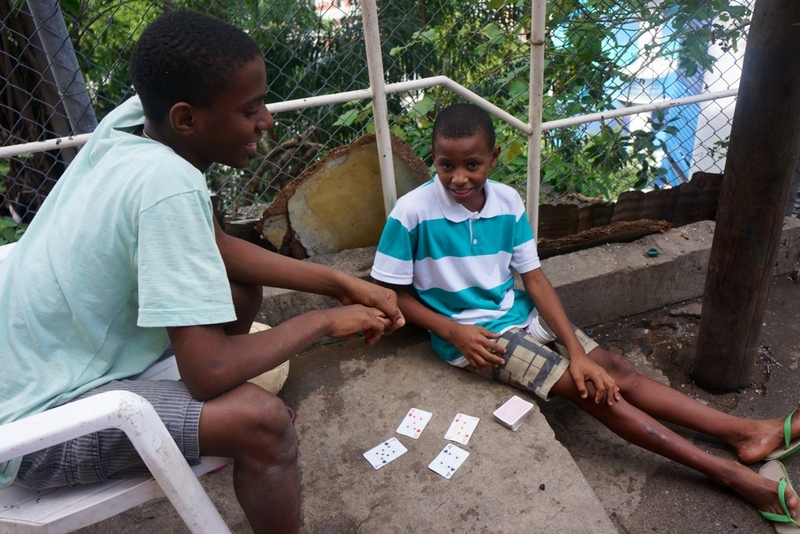 Rodrigo has established relationships with many of the people in the favela we are visiting, has organized New Years parties that bring people up to the favela to view the activities on Copacabana Beach below. 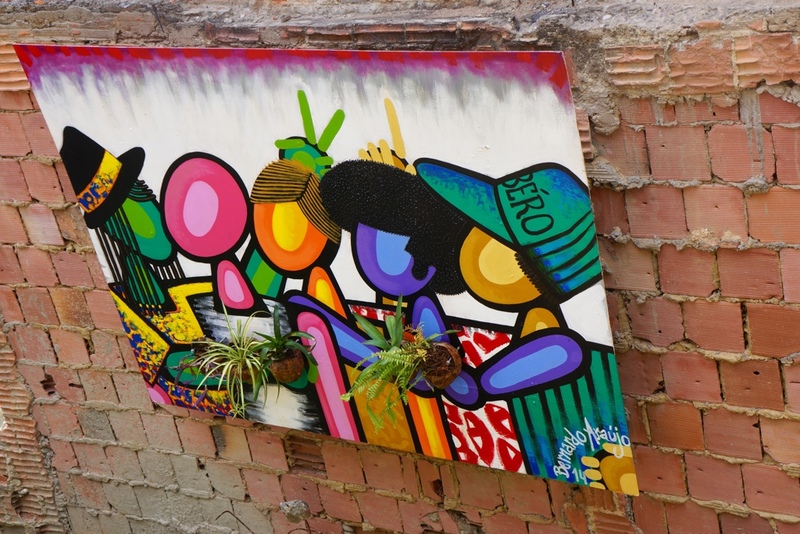 He also has favela residents involved in the tours he does, thus getting them funds. His goal is for them to take it over. 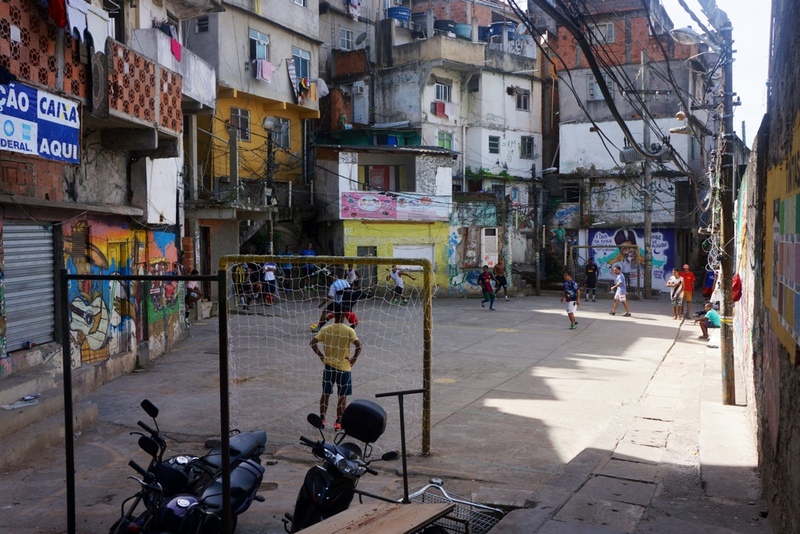 Both of Rodrigo’s parents grew up in favelas and made their way out, against substantial odds through hard work. Rather than try to integrate what we leaned into poetic form, which is Carol’s bailiwick anyway, I’ll just try list some of those things, in no particular order. 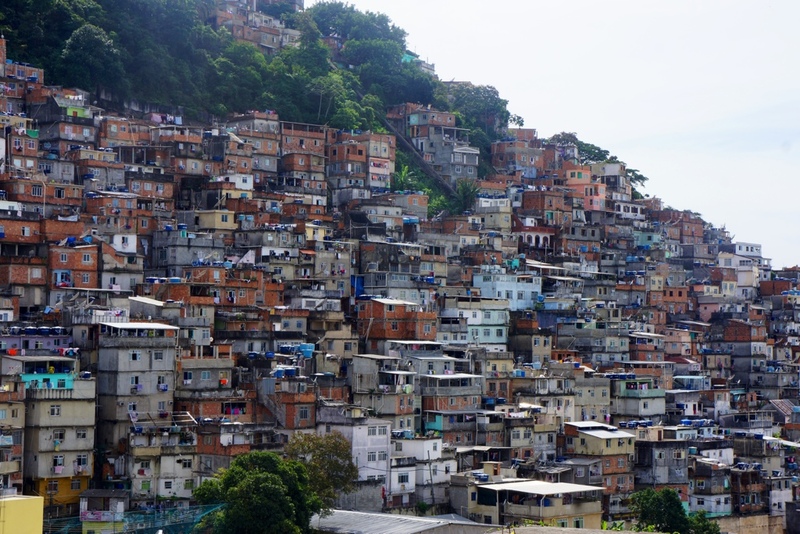 1.8 million of Rio’s 6.2 million people live in favelas. Many of them started in the late 19th century, when slavery was abolished and people moved into the cities. Housing was built by these people, originally of wood, and they squatted on the land. Recent laws allow people who have lived in a place for five years to get title to the property. 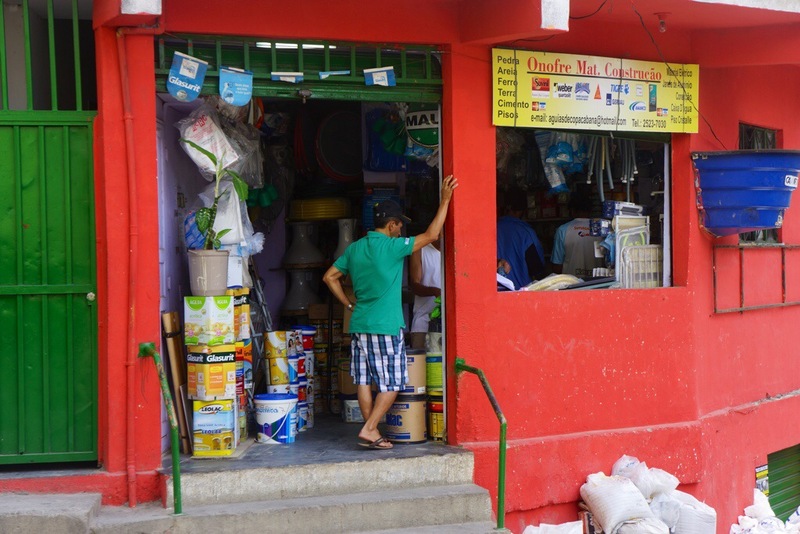 As this favela abuts a very well-to-do area and affords great water and beach views, land is starting to appreciate and beginning to be bought by people from outside the favela. 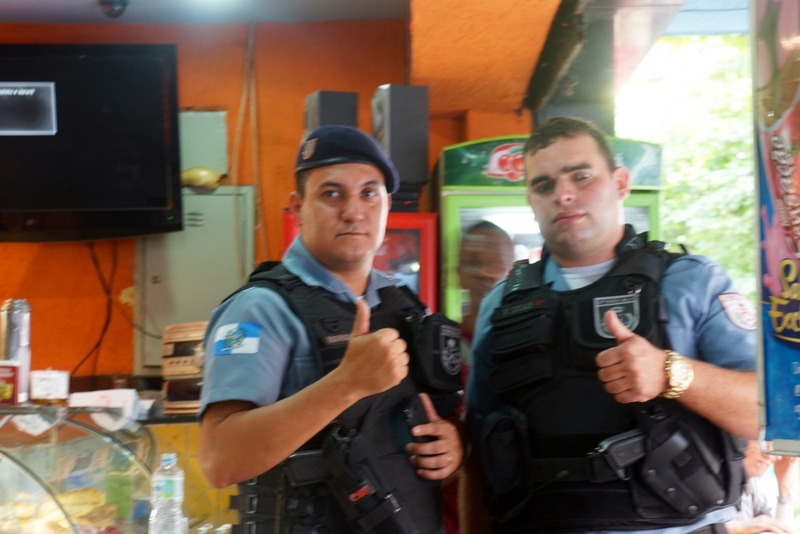 The government has begun to put many police in the favelas, originally to wrest control from drug lords. 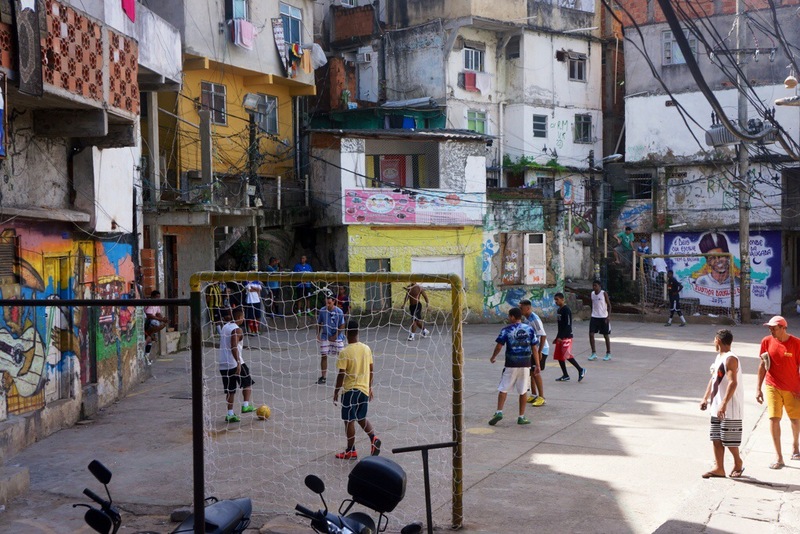 Police are viewed by most in the favela as the enemy. The recent riots broke out when police shot and killed a popular dancer, who happened to be in the wrong place at the wrong time. Rioting broke out and fires were set. 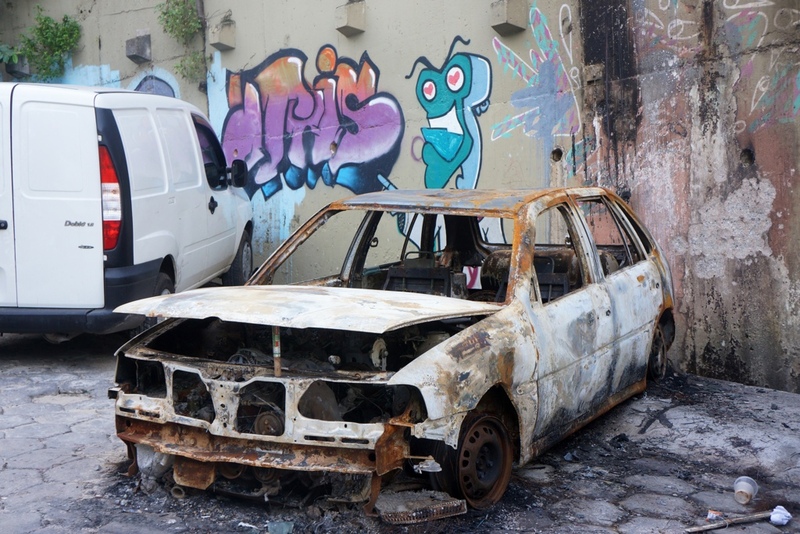 The photos below include one of a burned out car and another wall with a mural of the dead dancer. Though favelas are supposed to be very tough places, oddly, Carol and I both feel safer in the favela than we did in downtown Rio yesterday. This is largely because we are with Rodrigo, a tall, handsome young man who clearly has excellent relations with favela residents. 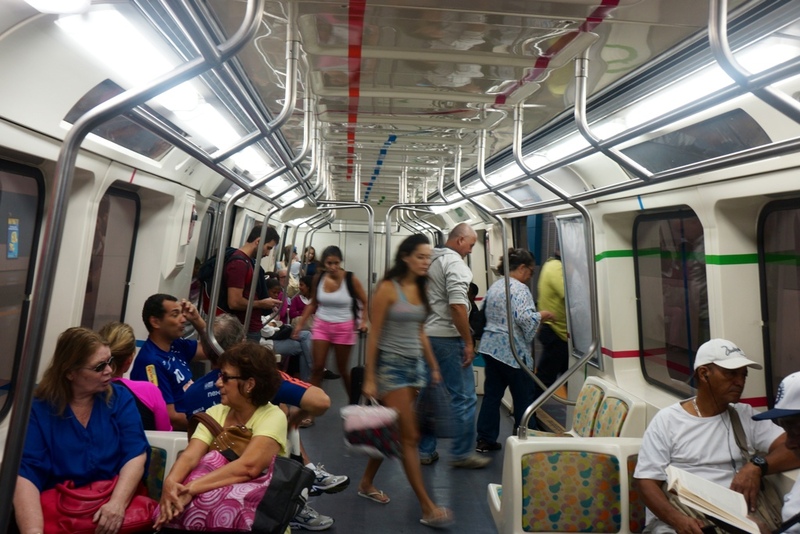 The government has paved some roads, put in a new subway station with an elevator, pumped water up to the houses, put in a new school, etc. Things are improving, but there’s still a long way to go. Everyone in the favela has a cellphone, according to Rodrigo. 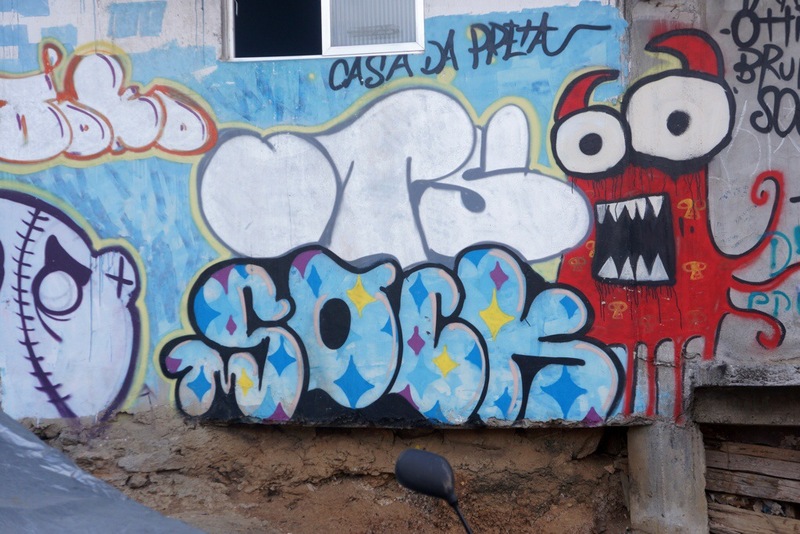 We watch a soccer game on a cement lot, meet a young favela artist and see some of his paintings, then walk all the way down the hill and stop for a soft drink. Rodrigo puts us in a taxi, headed for the botanical garden. This was not to be part of our tour, but we’ve decided to add it. Luiz offered to pick us up and take us there to show us around, but we didn’t think it was worth the fee and that we could as easily do it on our own. 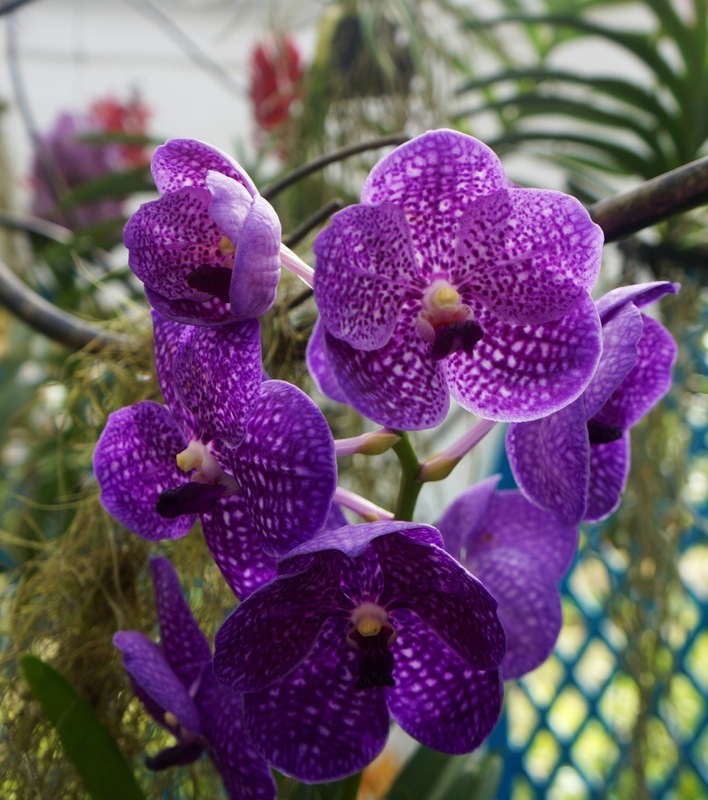 The gardens are huge and impressive, but we’re too tired and hot to do more than go to see a special orchid exhibit, then take a nice, air-conditioned taxi back to our hotel. We have large, delicious cheese sandwiches on our veranda. We’re happy to have almost five hours before dinner to relax, blog, pack, shower, etc. We take a walk over to the studio of an artist whose paintings we’ve admired at the hotel. He is very gracious in inviting us in, showing us around and introducing us to his wife. His current work is with bottle caps, interesting in its way, but a far cry from what we’d admired. He spent five years in New York in the 80’s, studying new techniques for his art. He lives and works I a beautiful old house with lovely views and heavy, chained security. We walk from there to a local restaurant that had been recommended by our hotel, and we have a very good meal, filet mignon covered with cartelized onions and a nice wine sauce, wrapped in greens and sitting on potatoes. We come back to the hotel, settle up our bill and prepare to taste the night life of Rio. 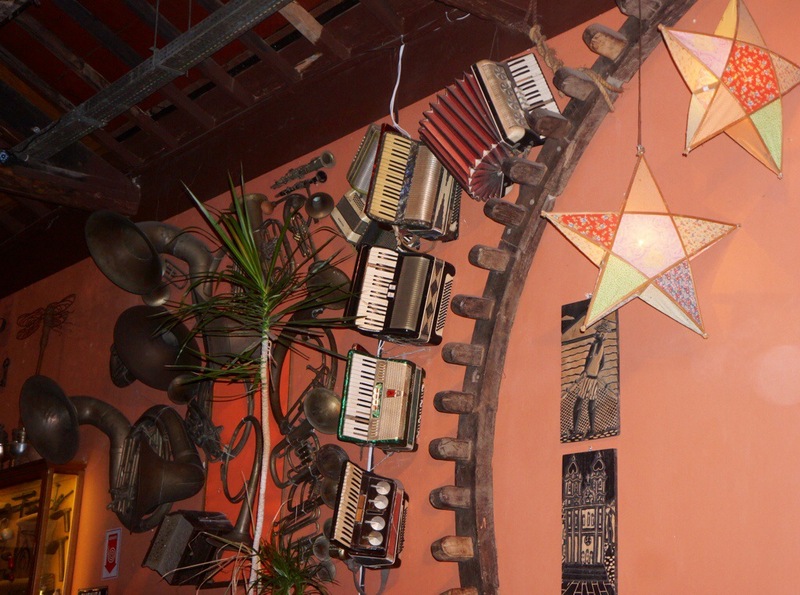 Rio is renowned for its samba music and informal, laid-back way of life. 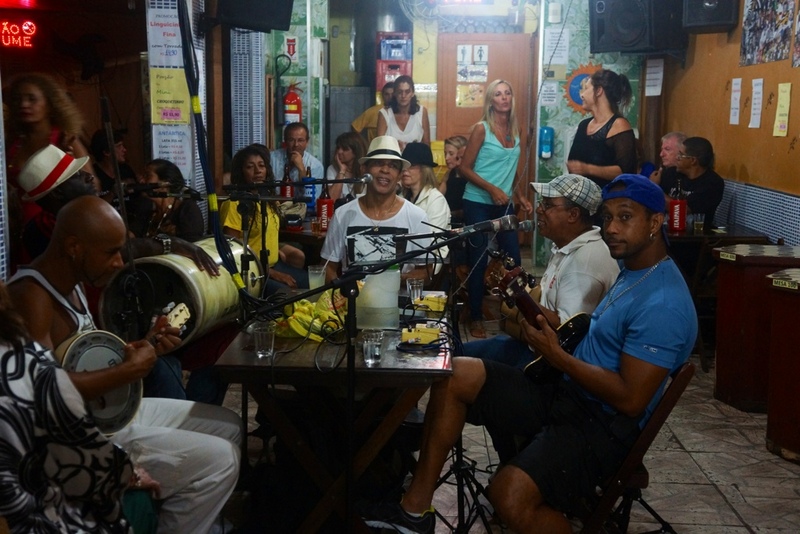 One characteristic aspect of Rio’s nightlife is the many hidden venues where cariocas (Rio’s inhabitants) gather for a roda de samba. 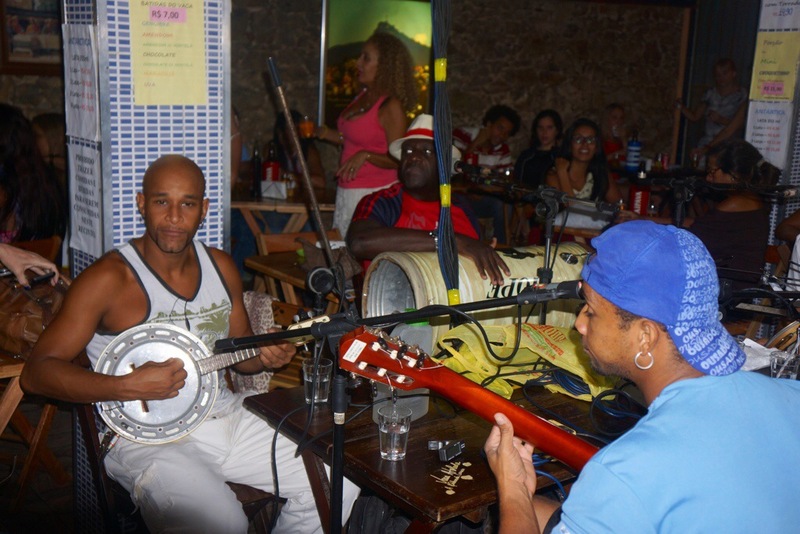 The atmosphere is that of a typical street party – a group of musicians plays well-known samba songs around a table, while a crowd of onlookers sings along to the music, drinking ice-cold beer or caipirinhas. Tonight we pretend we’re cariocas, though the discerning native could probably tell us apart. The first place is a really local bar in which we may well be the only outsiders. 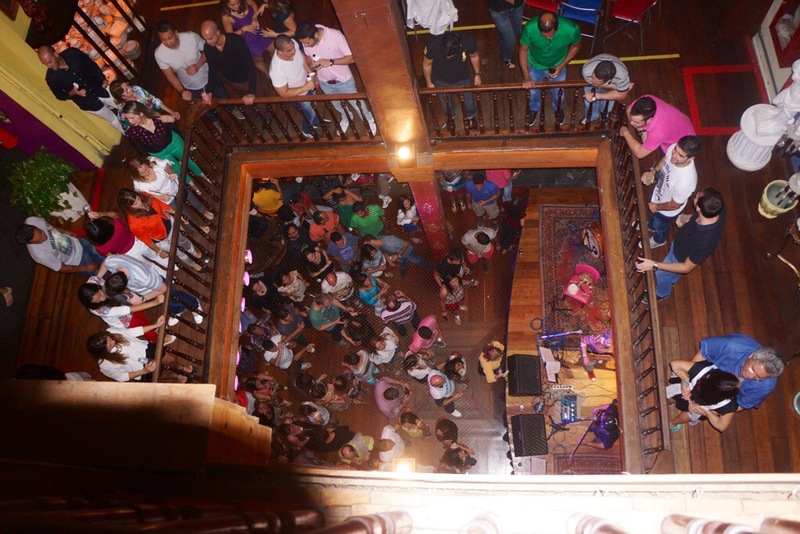 People know and greet each other and the musicians. We stay for two or three sets. 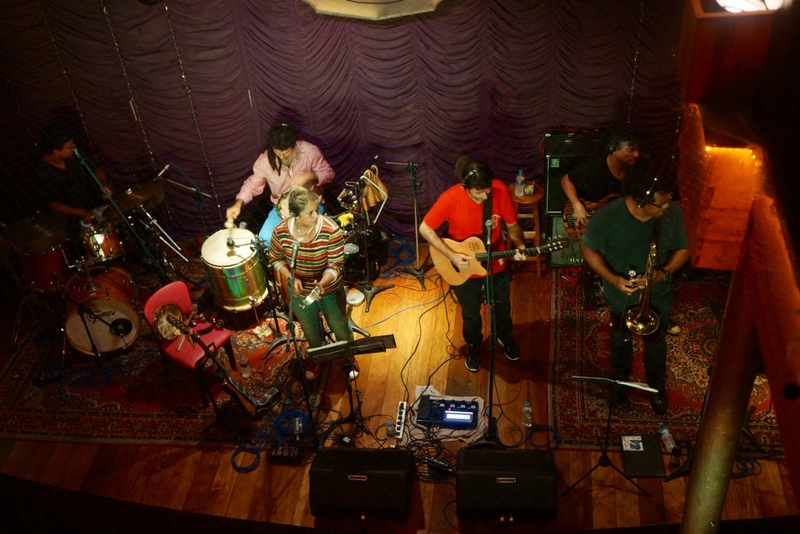 Afterwards we continued to a typical samba bar in a large, funky restored building in the bohemian district of Lapa, to hear live music. We call it quits after this bar, say goodbye to Rodrigo and taxi home, arriving at 12:15, not much before we need to arise at 5 tomorrow morning. We’re looking forward to getting to an area where any danger is likely to come from non-human animals. I’m reading backwards til I get caught up . . . Sounds very lively (especially the local bar life with all that included). I gather there’s been some unexpected, unwelcomed activity, too (in addition to the aftermath of the riots tour), which I’ll read about soon. I especially like the photo of the boys playing cards, Dadz. And I like that the discerning locals might be able to pick you out of the crowd. Hi! The police thing is weird. It’s the opposite from our country, huh? Were you there when the police killed the dancer? I love all the pictures, but I pretty much say that in every comment. Keep it up! I love the beautiful garden, just please don’t tell my manly friends. Maxi is 18. He would like to thank his sister, Zoe, for writing this, even though he is not aware of it. 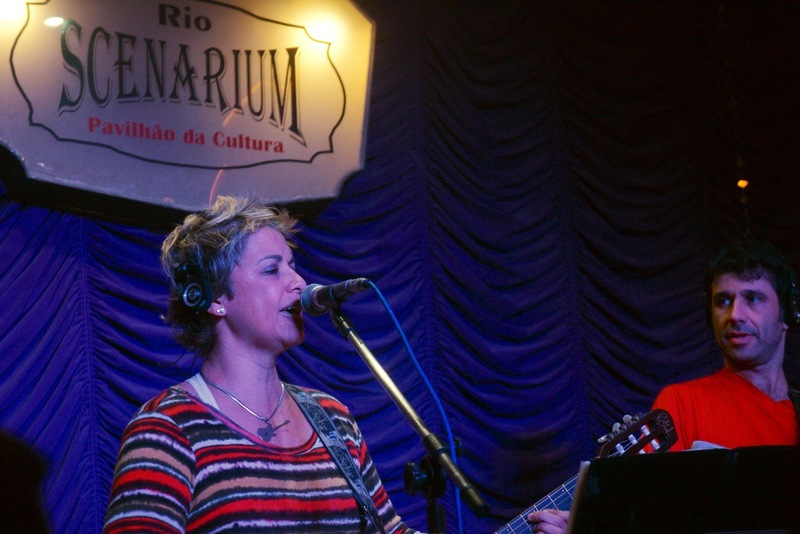 Love the favela, clubs and botanical gardens stories. Great going. Hi, Boppp. I love the pictures; they are very pretty, especially the ones on=f the garden and the flowers. I also love the close-ups of the people/kids. 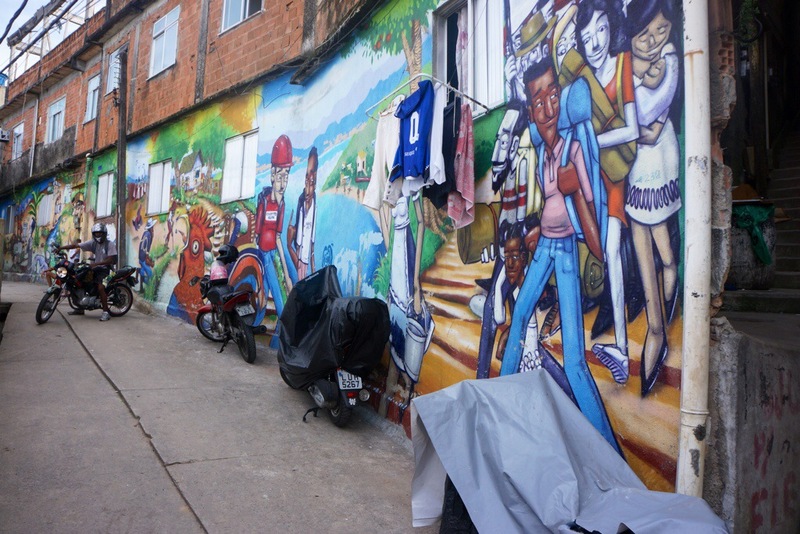 Sounds like Rodrigo is a great guide–It must have helped that he knew a lot of the people at the favelas!